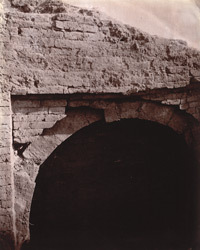 Photograph of an arch in a ruined cloisters dug up near the Indpai or Indappe Tope, at Jamui, Monghyr (Munger) District, taken by Joseph David Beglar in 1872-73. Beglar was unable, "owing to active opposition from the Raja's people", to investigate the site in detail, "but I can confidently say that a careful and thorough examination of the mounds, and especially of the great tope here, will prove a great acquisition to our present meagre knowledge of ancient Indian structures." Bengal list pp. 418-419; J.D. Beglar, Report of a tour through the Bengal Provinces...in 1872-73 (A.S.I. vol. VIII, Calcutta, 1878), pp. 120 A later survey of the stupa has shown that it is 125 feet in diameter and 35 feet tall although it originally must have been taller: it is in now in a ruinous condition .